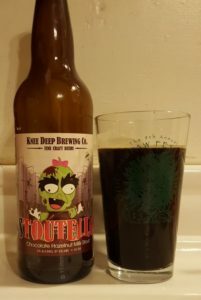 Stoutella is Knee Deep Brewing Company’s (Auburn, CA) chocolate hazelnut milk stout. The beer pours with a dark brown coloration and a fairly small head that dissipates fairly quickly. The presence of the hazelnuts in Stoutella calms down the tendency of milk stouts to be on the sweeter side of things through the presence of a fair amount of bitterness. There is a diverse set of flavors that are presented throughout one’s experience with a can or bottle of Stoutella. While the caramel and brown sugar elements are present from the onset, there are notes of cocoa and toasted malt that come forth soon after. The bit of hop bitterness comes forth to refresh one’s palette as each sip concludes. I feel that it is the incredible depth of flavors that one will experience here that really catapult Stoutella into the upper echelon of milk/sweet stouts we’ve reviewed at NeuFutur. The 6.0% ABV of Stoutella contributes to its overall allure as well. With just a bit of alcohol bite present here, each of the elements of this brew are able to shine in harmony. The drinkability of Stoutella increases because of this depth; instead of hammering the same few notes with this effort, the continually shifting and changing profile of this beer ensures that one can continue to enjoy their Stoutella experience even a few bottles into the night. For additional information about the entire range of Knee Deep’s year-round and seasonal efforts, make their main domain your next stop. Information about their new products can be located on their social media profiles, including Twitter and Facebook. Knee Deep has shown that stouts do not need to be single-note wonders; Stoutella shines with incredible complexity and an easy-going mouth feel.